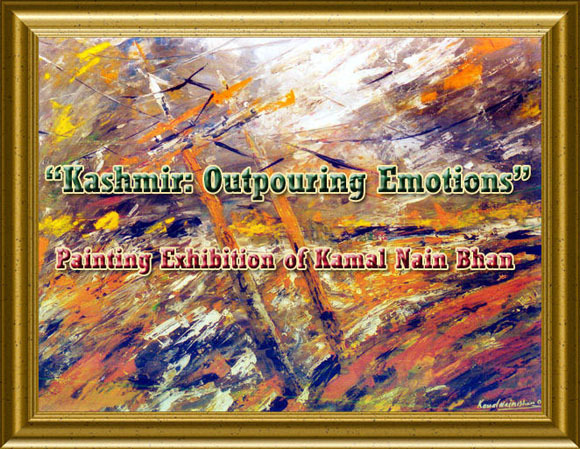 Painting Exhibition titled “Kashmir: Outpouring Emotions” of the artist, Shri Kamal Nain Bhan, was inaugurated by Shri Raman Bhalla, Hon’ble Minister for Revenue, Relief and Rehabilitation at Kala Kendra, Jammu today. Shri S. A. Zargar, Director, Handicrafts was the chief guest on the occasion. Shri Ashwani Kumar Chrungoo, President, Panun Kashmir, Dr. Jitendra Singh, Sr. 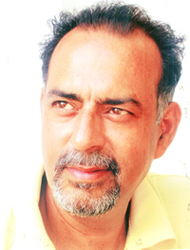 Journalist and Shri O. P. Sharma, Dy. Secretary, J&K Cultural Academy were the guests of Honour on the occasion. Smt. Savita Bakshi, Additional Secretary, J&K Cultural Academy presented a vote of thanks at the conclusion of the programme. The proceedings of the programme were conducted by Shri Virender Raina in his own charismatic manner giving the function a gorgeous facelift. 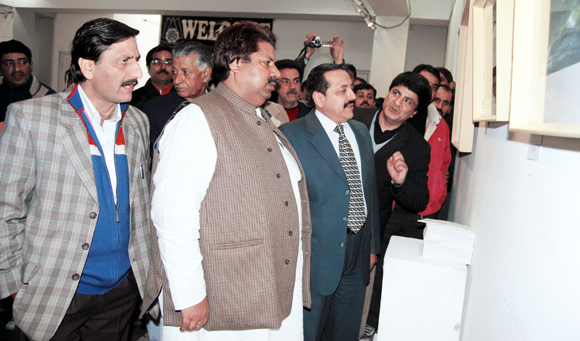 The programme was attended by various prominent citizens of Jammu including the veteran artist Shri Gokal Dembi. 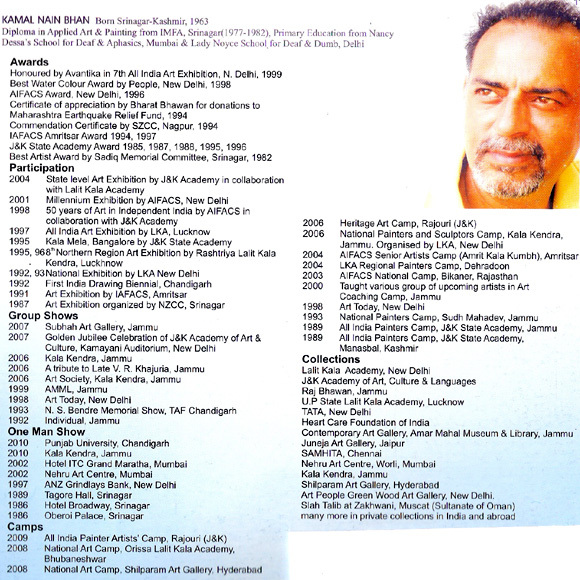 Shri Raman Bhalla in his speech commended the level of commitment of Shri Kamal Nain Bhan in the field of art. His paintings were reflection of the agony that the Kashmiri Pandit community has gone through in Kashmir. We as members of society need to support such brilliance of a physically challenged person who has successfully given shape to his emotions on canvass. I promise him all help in his future endeavours. 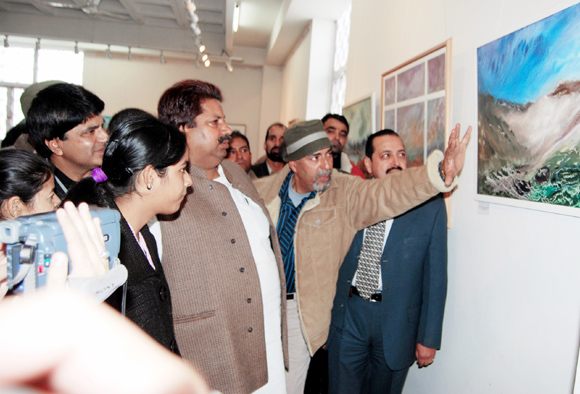 Shri Bhalla offered a ‘special saropa’ to the artist on behalf of the displaced community of Kashmir. Shri Ashwani Kumar Chrungoo, in his address, said that Shri Kamal Nain is a very competent artist who has brought out his internal pain and anguish through colours before all of us. Though he has not been able to catch the attention of the people till date because of his resourcelessness, we promise him all support. 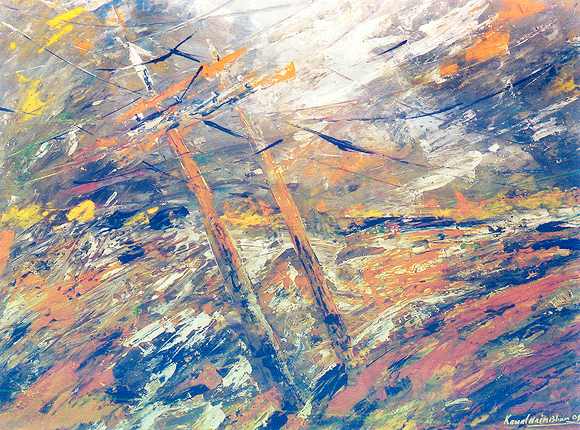 His themes are varied and within his range come simple presentations in lucid art forms. Shri Bhan’s release of these paintings in connection with 20th Holocaust Day is laudable. 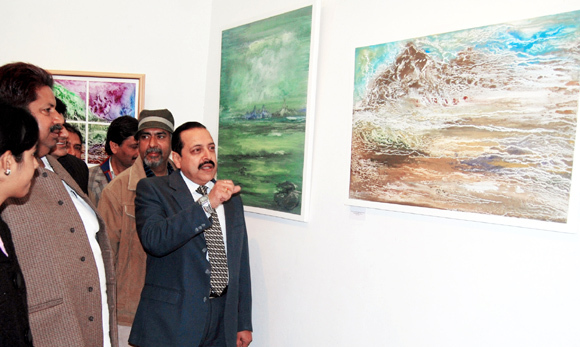 Dr. Jitendra Singh in his speech made reference to the paintings of Shri Bhan depicting exodus and holocaust of Kashmiri Pandits in a highly abstract form. 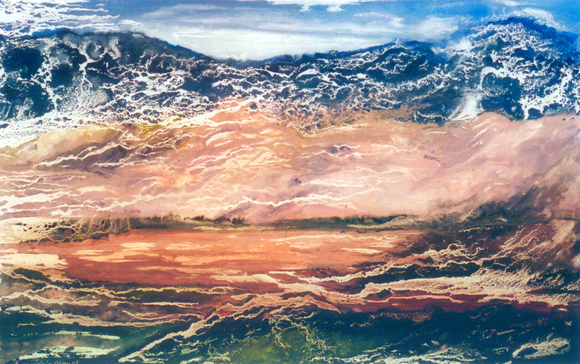 His connection with the landscape of Jammu during the last 20 years, as depicted in the paintings, has a great message for the society. It is heartening to note that Shri Bhan has received sponsorship of the J&K Cultural Academy and for that we express our gratitude to the Academy. Shri Z.A.Zargar, in his address, mentioned the role played by artists and cultural activists in promoting social ethics and values. He showered praise in favour of Shri Bhan and expressed the hope that the paintings convey our feelings regarding the community which has been displaced due to turmoil. He also showered kudos on Shri Bhan’s relentless work and said that his exhibition is a revelation and thanked the organizers of the event for such a discovery. Shri O.P.Sharma gave an account of the details which led to the inauguration of the exhibition and said that the Academy shall always provide all possible assistance to the artist. The family of Shri Bhan was also specially present on the occasion. The efforts of Shri A.K.Karwani, father of Shri Kamal Nain, who lent all moral and resource support to the artist, were appreciated. An appeal was made to the media to highlight the contribution of Kamal Nain in an appropriate manner so that the physically challenged discovered artist received proper attention. 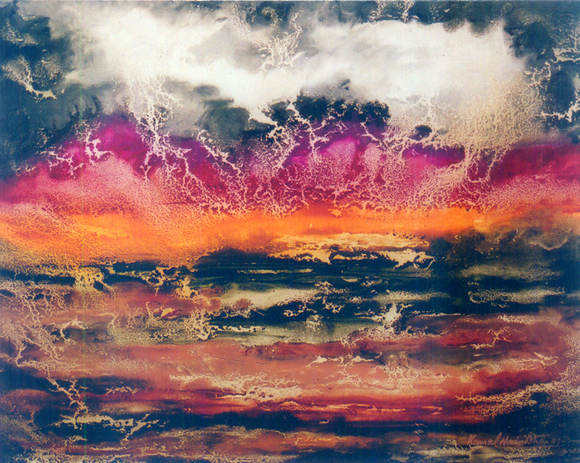 The few paintings that are in this website are "out of this world", those are the only words that come to mind. Congratulations to Bhan sahib.